The CSU, Chico Geological and Environmental Sciences Department offers three bachelor’s degrees and two master’s degrees in the academic disciplines of environmental science, geology, and geosciences. The Department also provides training for students who wish to become single-subject science teachers as well as for a certificate in hydrology. All disciplines within the department are directed toward understanding the terrestrial system from the core of the Earth to beyond our solar system. Students conduct applied and basic research to better understand physical processes on and within the Earth, and human influences that affect the environment. The last three presentations listed are all part of a seminar discussing one of the biggest natural and nuclear disasters in history - the massive earthquake and tsunami that hit Japan on March 11, 2011. 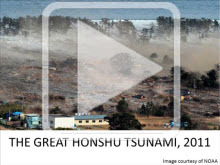 Faculty from the Department of Geological and Environmental Sciences break down these events in a three-part series -- 9.0 Earthquake, Tsunami, and Nuclear Disaster. Each lecture is presented by a CSU, Chico professor and is filled with stunning statistics and easy-to-understand explanations. Dr. Teasdale shares her research, gathered on site in Hawaii and the Galapagos Islands, on the role of groundmass crystals in lava flow emplacement. As a graduate student, she rushed to the Galapagos, located off the coast of Ecuador, in 1998 to witness the eruption of the Cerro Azul volcano. She has been studying lava flows ever since. Dr. Teasdale has also gathered specimens from the Hawaiian volcanoes of A’a and Pahoehoe. Some of her lava specimens were collected hot and then placed in cold water in order to get “a snapshot of a moment in time” of the crystallization process in the basalt. California’s energy systems are more than just a network of interconnected pipes and wires. Mr. Rhyne presents an overview of the interrelated physical, market, and regulatory elements that make up California’s energy systems. 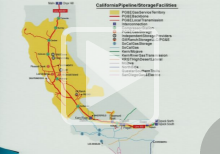 He calls all of these elements, which form a multi-layered network, an “energy ecosystem.” He also discusses some of the key drivers leading California to strive to create the energy networks of the future. How Can Doppler Lidars Measure Turbulence in the Lowest Part of the Atmosphere? Dr. Mann, a respected global authority on atmospheric physics, discusses his work developing a model to measure wind turbulence. He uses lidar technology, which operates similarly to radar technology but uses light waves instead of microwaves. Dr. Mann’s model has been used to describe the turbulent inflow to wind turbines in order to calculate the dynamic loads. Dr. Mann’s visit corresponds with CSU, Chico Geoscience Professor Shane Mayor’s wind research project at the University Farm. 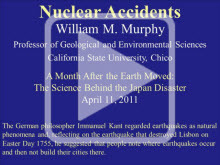 In clear language and with a helpful PowerPoint presentation, Dr. Bykerk-Kauffman explains the geology behind the massive earthquake that hit Japan on March 11, 2011. She notes that this 9.0 quake lasted for minutes instead of seconds, and illustrates why it was so devastating. Faults, plates, deep-sea trenches, and seismic waves are all part of the discussion. As Dr. Shapiro explains, the word "tsunami" literally means "harbor wave." Tsunamis, also known as tidal waves, all occur due to a shifting of land below water. Dr. Shapiro talks about the causes and history of tsunamis. He also discusses ways to be prepared for a tsunami, and he maintains that "nobody should ever die from a tsunami." Dr. Murphy's goal for his presentation is putting Japan's 2011 nuclear accident in the context of the larger picture of nuclear accidents. He first explains basic concepts - fission, radioactive decay, radiation, and the chemical reaction that releases radiation. Dr. Murphy then explains the boiling water system at the Fukishima reactor, where the Japanese accident occurred due to the 9.0 earthquake. He also discusses previous major accidents at Three Mile Island, Pennsylvania (1979) and Chernobyl, Ukraine (1986).